BRUSSELS, Ukraine -- NATO's chief said on Monday that Russia had built up forces on the border with Ukraine and sent more military hardware into eastern Ukraine, enabling pro-Russia separatists to launch attacks with little warning if they chose. A military parade marking the 70th anniversary of the victory over Nazi Germany in WWII is held in Donetsk, eastern Ukraine, Saturday, May 9, 2015. 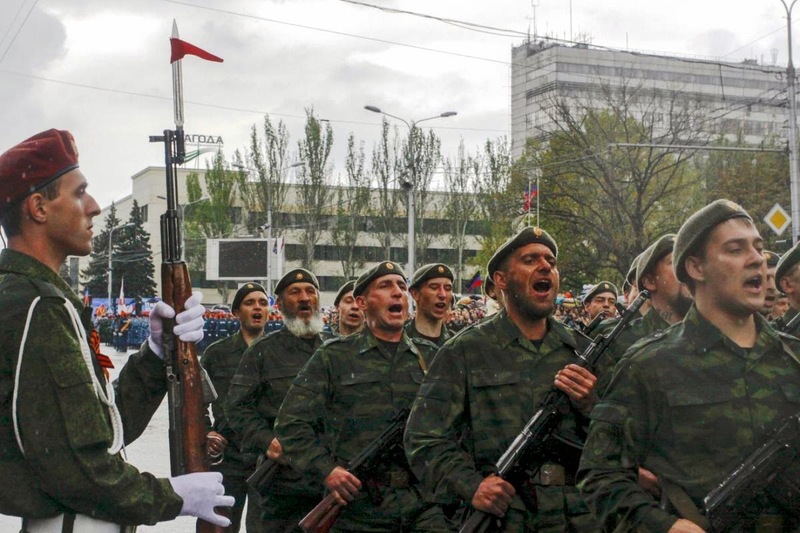 Russia-backed separatist fighters took part in the parade. "There has been a Russian build-up, both along the borders between Russia and Ukraine but also inside eastern Ukraine, with a steady flow of heavy equipment, tanks, artillery, ammunition, air defense systems and a lot of training," alliance Secretary-General Jens Stoltenberg told a news conference. "So they have the capacity, the capability to launch new attacks with very little warning time. But of course no one can say anything with certainty about the intention." A NATO foreign ministers' meeting in Turkey this week is due to discuss Ukraine. Relations between Russia and the West are at their lowest ebb since the end of the Cold War due to Moscow's annexation of Ukraine's Crimea peninsula in March 2014 and its backing for the rebels. The West has imposed economic sanctions on Russia, triggering retaliation by Moscow. Russia denies Western and Ukrainian accusations, which they say they have documented, that it is arming the separatists. Stoltenberg said Russia's support for the separatists was a "blatant violation" of the Minsk ceasefire accord. He said there had been a rise in ceasefire violations, more deaths, and obstruction of monitors. "Just the existence of these (Russian) forces along the border, but also inside eastern Ukraine, is in itself a violation of the Minsk agreement but it is also intimidating and putting pressure on Kiev and on Ukraine," he said. NATO's top commander, U.S. Air Force General Philip Breedlove, said last month that Russia might be taking advantage of a lull in fighting in eastern Ukraine to lay the groundwork for a new offensive. Ukraine has also said the threat of large-scale fighting in the east is growing. Stoltenberg urged Russia to stop supporting the separatists and called for the withdrawal of heavy weapons and for OSCE monitors to be given full access and security guarantees. He said it was "of great concern that we have seen this steady build-up of military presence and support for the separatists over such a long time". Russian Foreign Minister Sergei Lavrov and U.S. Secretary of State John Kerry will discuss the Ukraine crisis on Tuesday in Russia's Black Sea resort of Sochi, RIA news agency quoted a diplomatic source as saying.